I am housesitting at the moment. 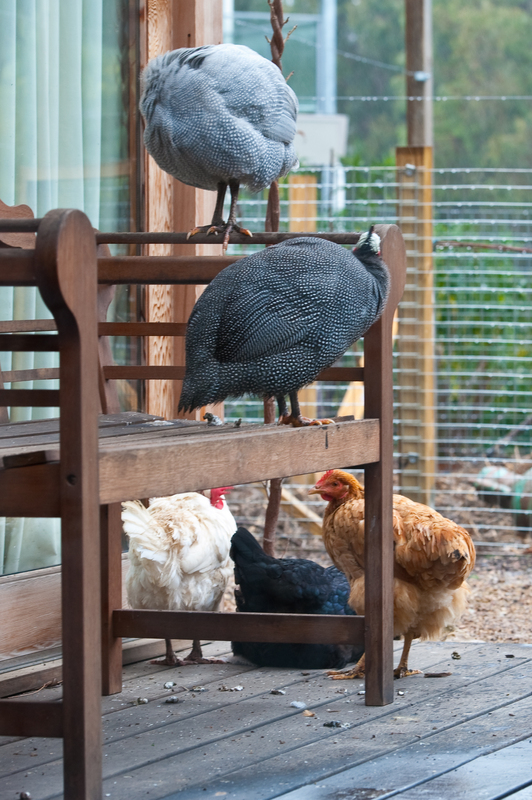 Along with the house comes three chooks and two guinea-fowl, who spend their daylight hours desiring the other side of the chicken wire. All five rush to the gate of their pen in the morning, desperate to be released into the garden. Once free, they set about displacing the ordered paths and beds of the garden. 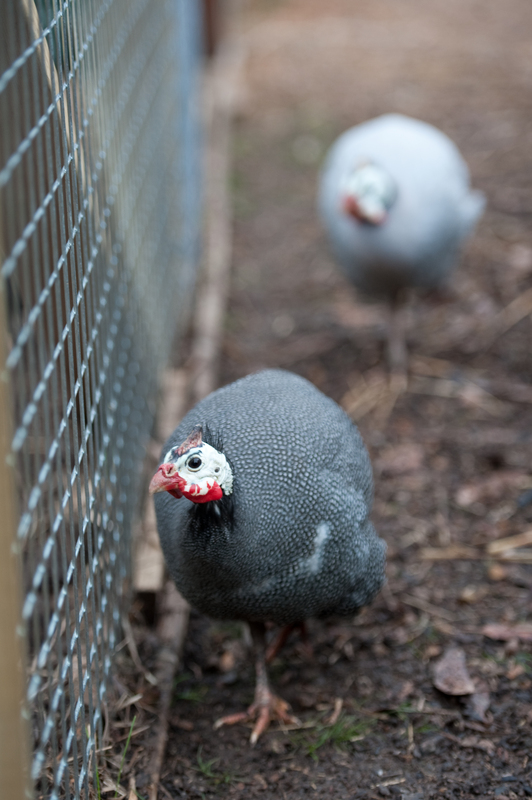 The guinea-fowl are capable of flight, but have a tenuous grip on short term memory. When let out into the day pen, they take immediate flight into the garden. They fluff their feathers, examine their feet, realise the chooks are left back in the pen, and then proceed to pace back and forth outside the pen for the rest of the day, oblivious of the garden, and desperate for incarceration with their homeys. The chooks are far more independently spirited. Henny Penny has figured out how to fly out of the pen as well, and will spend all day digging up the garden without a backward glance. Aretha has not figured out how to escape, but is in a permanent state of readiness, DEFCON 4 in West Wing parlance. With an ever vigilant eye on the gate, or on someone who could open it, Aretha likes it when the Guineas fly out, because this usually leads to gate opening, and she is a patient gal. Julia is the gentle one. She gets the tough end of the roost, always last to be allowed up, and repeatedly booted off by the Guinea fowls. As I was at home today I decided they could all have a garden day. They stormed the gate, raced out, and jumped into the spring onion bed. Thirty minutes later, all five were grouped on the deck looking out at the rain, where they remained until I herded them back into the pen.